This is Heather Esper, senior program manager, and Yaquta Fatehi, senior research associate, from the Performance Measurement Initiative at the William Davidson Institute at the University of Michigan. Our team specializes in performance measurement to improve organizations’ effectiveness, scalability, and sustainability and to create more value for their stakeholders in emerging economies. 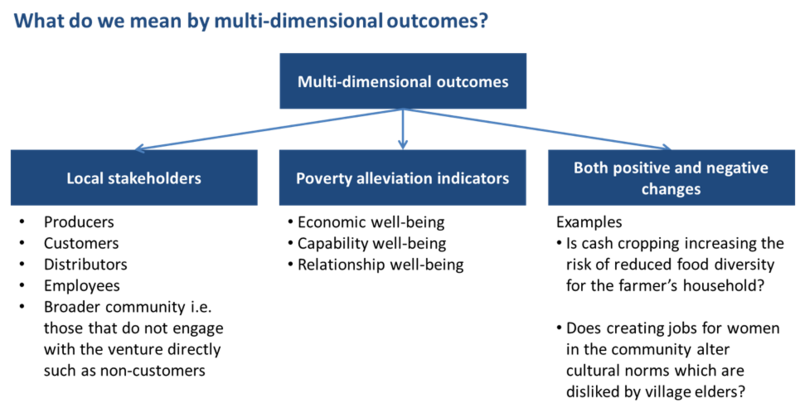 Our contribution to social impact measurement (SIM) focuses on assessing poverty outcomes in a multi-dimensional manner. But what do we mean by multi-dimensional? For us, this refers to three things. It first means speaking to all local stakeholders when assessing change by a program or market-based approach in the community. This includes not only stakeholders that interact directly with the organization, such as customers or distributors from low-income households, but also those that do not engage with the venture ? like farmers who do not sell their product to the venture, or non-customers. Second, this requires moving beyond measuring only economic outcome indicators; it includes studying changes in capability and relationship well-being of local stakeholders. Capability refers to constructs such as the individual’s health, agency, self-efficacy, and self-esteem. Relationship well-being refers to changes in the individual’s role in the family and community and also in the quality of the local physical environment. Thirdly, multi-dimensional outcomes means assessing positive as well as negative changes on stakeholders and on the local physical and cultural environment. We believe assessing multidimensional outcomes better informs internal decision-making. For example, we conducted an impact assessment with a last-mile distribution venture and focused on understanding the relationship between business and social outcomes. We found a relationship between self-efficacy and sales, and self-efficacy and turnover, meaning if the venture followed our recommendation to improve sellers’ self-efficacy through trainings, they would also likely see an increase in sales and retention. Start with existing questions developed and tested by other researchers when possible and modify as necessary with a pretest. Pretest using cognitive interviewing methodology to ensure a context-specific survey and informed consent. We tend to use a sample size of at least 12. For all relevant questions, test reliability and variability using the data gathered from the pilot. We tend to use a sample size of at least 25 to conduct analysis, such as Cronbach’s alpha of multi-item scale questions).